Age 1 Entertainment is a very unique company in that, it is both a Live Event Promotion company AND a Television Production company - all in one! As a result, Age 1 Entertainment serves as your "one-stop-shopping source" for "legitimate" turnkey productions that go straight to broadcast! We are capable of promoting your event, producing the entire event for television, and making sure your event airs on Broadcast TV .... Not too many production or promotion companies can boast of that! Members of our staff happen to be veterans of the broadcast television industry and as a result, we have a wealth of television industry contacts and connections, which enables us to secure the proper television destination for your Live event and or productIon. Our company specializes in Boxing and MMA productions and we are committed to promoting and producing Live Events that will soon re-define and re-shape the Boxing and MMA industries! 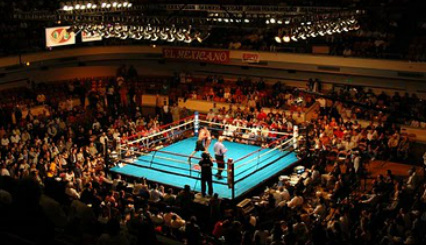 Our goal is to promote top notch Live events, and in doing so, create the next Superstars in world of Boxing and MMA! In the past, we've helped promote events involving "Celebrity Boxing", "New England Ringside Boxing", "The GSE Jim McMahon Celebrity Golf Invitational", and "The Do-Right Challenge, Fights For Families" with former Boxing Heavyweight Champion of the World, James "Bonecrusher" Smith. We also offer representation and career management for fighters, athletes, etc. For more information, please visit our Representation page. We are poised to deliver the very best in Live event production and we can't wait to work with all of you in the coming months .... And remember, as the old saying goes..... "We'll see YOU ….. AT THE FIGHTS"!! !